Thailand’s Department of National Parks, Wildlife and Plant Conservation (DNP) has announced that Maya Bay in Hat Noppharat Thara-Mu Ko Phi Phi National Park will not allow visitors during a much needed four-month rejuvenation period from 1 June to 30 September, 2018. Travellers can still catch a glimpse of the Bay’s stunning beauty, made famous by Leonardo DiCaprio’s movie ‘The Beach‘ at a 400-metre distance, or between the two cliffs that form a natural entrance to the lagoon. But this will be strictly supervised and carefully monitored by the DNP. 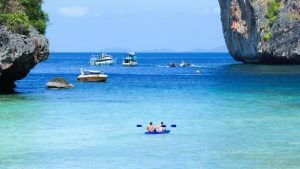 Krabi Vice Governor Mr. Apinan Puakpong noted that only Maya Bay will be closed to visitors while neighbouring Mu Ko Phi Phi (Phu Phi islands) and its beautiful beaches remain open to the public.